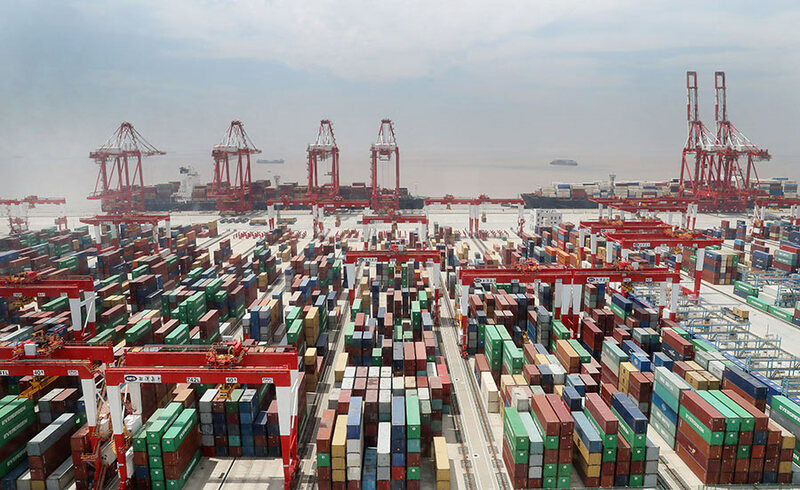 CNBC reports, "China on Wednesday released a slew of official economic data that beat expectations, including the widely anticipated gross domestic product figure. Beijing said its economy expanded by 6.4 percent year-on-year in the first quarter of 2019, topping the 6.3 percent that analysts polled by Reuters had expected. China's economy grew by 6.4 percent year-on-year in the fourth quarter of last year, and 6.8 percent in the first quarter of 2018. The Asian economic giant also released other economic indicators: Industrial production jumped 8.5 percent year-on-year in March — surging past the 5.9 percent estimated by Reuters to register the fastest growth since July 2014; Retail sales for March grew by 8.7 percent year-on-year, beating Reuters' projection of 8.4 percent; Fixed asset investment in the first quarter increased by 6.3 percent year-on-year, in line with expectations." Reuters reports, "The U.S. trade deficit fell to an eight-month low in February as imports from China plunged, suggesting President Donald Trump's 'America First' agenda was starting to bear fruit. The surprise narrowing in the trade gap reported by the Commerce Department on Wednesday also implied a much stronger pace of U.S. economic growth in the first quarter than initially anticipated at the start of the year. The 20.2 percent drop in imports from China was the main driver behind a nearly 3.4 percent improvement in the U.S. trade deficit to $49.4 billion in February, data from the Commerce Department showed. The trade deficit has narrowed for two straight months. Economists polled by Reuters had forecast the trade shortfall would widen to $53.5 billion in February. The politically sensitive goods trade deficit with China - a focus of the Trump administration's protectionist trade policy - decreased 28.2 percent to $24.8 billion in February as U.S. exports to the world's No. 2 economy jumped 18.2 percent." Bloomberg reports, "High on the list of President Donald Trump's priorities as he tries to close a trade deal with counterpart Xi Jinping is making sure China faces consequences if it doesn't live up to its promises. Yet in pursuing that goal Trump may also be giving China a new cudgel to use on American companies and striking another blow to the international rule of law. Treasury Secretary Steven Mnuchin has said the U.S. has made its own commitments to China and agreed that both sides will be subject to an enforcement mechanism. 'This will be a two-way agreement in enforcement,' Mnuchin said Monday, after saying over the weekend that the U.S. would be open to 'certain repercussions.' Details of the U.S. commitments and how the enforcement mechanism will operate remain scant. But Mnuchin's comments have caused plenty of raised eyebrows from legal scholars to the business community and Congress." The New York Times The Man Who Made Your iPhone Wants to Run Taiwan. A Sea Goddess Backs Him, He Says. The Washington Post China Pledged to Give Foreign Financial Firms More Access. How's That Going?